Maximizing Progress: Grand Inga Dam ~ African Congo Hydropower! 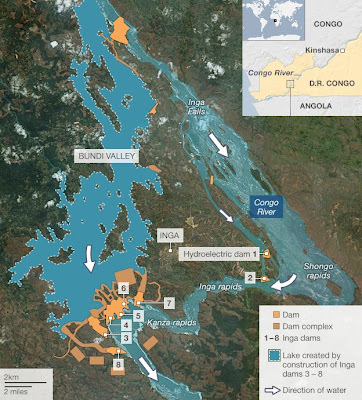 "Grand Inga dam in the Democratic Republic of Congo will generate twice as much electricity as the world's current largest dam, the Three Gorges in China, and jump start industrial development on the continent, bringing electricity to hundreds of million of people. 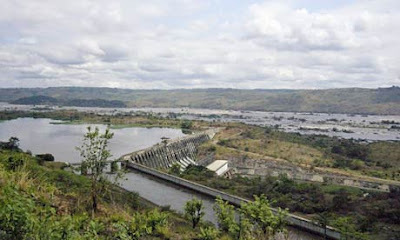 But while governments and banks expect the dam to export electricity as far away as South Africa, Nigeria and Egypt, and even Europe and Israel, environment groups and local people warned that it could bypass the most needy and end up as Africa's most ruinous white elephant, consigning one of the poorest countries to mountainous debts. The dam is being planned to exploit one of the largest major water falls by volume anywhere in the world -- nine miles of rapids which lie 90 miles from the mouth of the Congo where the world's second largest river drops nearly 100 metres in just eight miles. 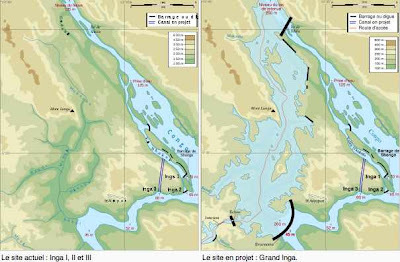 Two hydroelectric plants, known as Inga 1 and Inga 2, were constructed near there in the 1970s and a third is planned, but Grand Inga is intended to dwarf them all. One feasibility study suggests the 40,000MW dam will be 150m high, and will harness 26,000 cubic metres of water a second, with more than 50 turbines each producing nearly as much power as a British nuclear reactor. Grand Inga was proposed in the 1980s but never got beyond feasibility studies because of political turmoil in central Africa. But now it stands a chance..."
Here's a rendering of the region before and after construction of Grand Inga Dam... 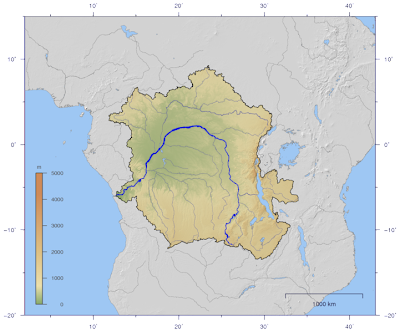 The larger region within which the Congo River flows... There are, of course, severe critics, including the International Rivers folks whose arguments should be considered seriously. And in addition to such huge gigaprojects, there are surely smaller and more distributed clean energy solutions to be deployed in the region, including Small, Micro, and Picohydro. But nevertheless, those 30-50 Grand Inga Gigawatts capacity would be a game-changer.